This short, concrete, and to-the-point book guides students through this vast field of conflicting opinions. The book begins from the premise that students benefit most from seeing a balanced treatment of all available views. For instance, this book provides coverage of both ad hoc and optimizing models. It also explores divisions such as flexible price versus sticky price models, rationality versus irrationality, and calibration versus statistical inference. By giving consideration to each of these 'mini debates;, this book shows how each approach has its good and bad points. Nelson C. Mark is Professor of Economics at Ohio State University. He has been widely published in journals such as the Economic Journal, Journal of Applied Econometrics, Journal of International Economics, American Economic Review, Journal of Finance, International Economic Review, Journal of Financial Economics, and Journal of Monetary Economics. He is presently editor of Journal of Money, Credit and Banking. The Central Bank's Balance Sheet. 2. Some Useful Time-Series Methods:. The Generalized Method of Moments. The Simulated Method of Moments. The Monetary Model of the Balance of Payments. The Monetary Model under Flexible Exchange Rates. Fundamentals and Exchange Rate Volatility. An Introduction to the Calibration Method. 5. International Real Business Cycles:. Calibrating the One-Sector Growth Model. 6. Foreign Exchange Market Efficiency:. 7. The Real Exchange Rate:. Long-Run Determinants of the Real Exchange Rate. Long-Run Analyses of Real Exchange Rates. Appendix: Solving the Dornbusch Model. 9. 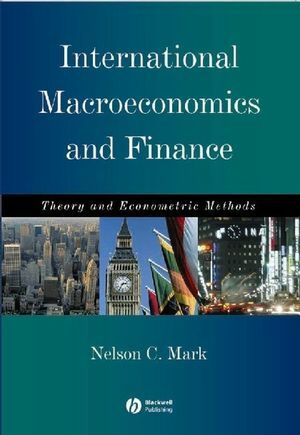 The New International Macroeconomics:.